Happy 50th Anniversary to Ron Kline! On January 30, 2015, Mansfield Plumbing employee Ron Kline reaches a career milestone most people would never dream of — 50 years with the same company — and with a perfect attendance record. Hired on January 30, 1965 at the age of 20 as a clean-up person at the Mansfield manufacturing facility in Perrysville, Ohio, Ron is still going strong. With no thoughts of retirement in his future, the father of 11 and grandfather of 38, relishes his work for the company. “I enjoy the people and what I do, so why should I consider retiring?” says Kline, who also owns a family farm in the Loudonville area of Ohio. 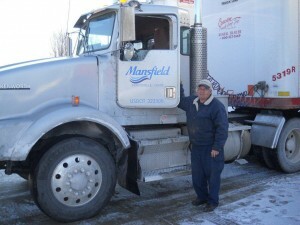 “This company has been a great place to have a career and it’s been good to my entire family. Married for 50 years to his wife Lois, Ron has been actively involved in his community his entire life. He coached basketball and softball at the high school level for decades and is a member of the Mohican Area Community Fund.